In the 1950s, on a small, rural campus in Corvallis, Oregon, a visionary Dean of Engineering recognized the huge potential in the emerging field of nuclear engineering. When the Atomic Energy Commission (AEC) began offering grants for universities to procure reactors and expand nuclear education, Dean George Gleeson jumped at the opportunity. In 1958, Oregon State University (then Oregon State College) received $250,000 to purchase an AGN-201 nuclear reactor. In a spirit of collaboration that was unique for the time, Dean Gleeson invited professors from chemistry and physics to join his engineering faculty in the AEC reactor operator training. By the following year, the AGN-201 was up and running in Dearborn Hall and a tradition of interdisciplinary research was born. In 1959, a nuclear engineering graduate program was established under the department of mechanical engineering. Soon after, a committee was formed to plan the building of a facility to house nuclear and radiation laboratories. The committee, chaired by Dr. Chih Wang (pictured at left), included members from animal nutrition, physics, food science, radiochemistry, and radiation biology, as well as the College of Engineering. Their efforts resulted in the creation of the Oregon State Radiation Center. 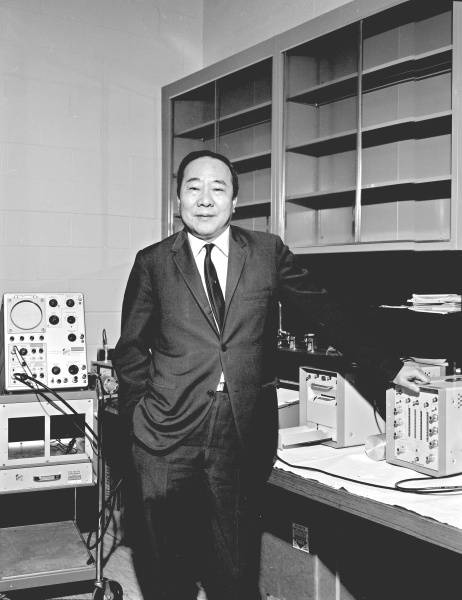 Dr. Wang was a persuasive advocate for nuclear science at Oregon State. In 1964, he convinced the Oregon Legislature to make a special appropriation matching a $300,000 grant from the National Science Foundation to build a TRIGA Mark II test reactor at the Radiation Center. Oregon governor Tom McCall attended the formal dedication ceremony in 1967. Oregon State University was among the first in the nation to offer an undergraduate curriculum in nuclear engineering. In 1968 the first Bachelor of Science in Nuclear Engineering was awarded, and the first freshman nuclear engineering class enrolled. The Nuclear Engineering Department was established as a separate entity in 1972. A decade later, Oregon State's radiation health physics (RHP) graduate program was transferred from the General Science Department to the Department of Nuclear Engineering, and in 1991 an undergraduate program in RHP was established. In 2015, the department was renamed to the School of Nuclear Science and Engineering to reflect the broad spectrum of nuclear-related studies housed within, including engineering, radiation health, medical physics, radiochemistry, and nuclear forensics. Dr. Chih Wang's spirit of forward thinking lives on today in the School of Nuclear Science and Engineering.